Growth form: Annual herb. Flowering. Mar–Apr. Status: Native. Common. Also recorded: Bahrain, Kuwait, E Saudi Arabia, UAE. 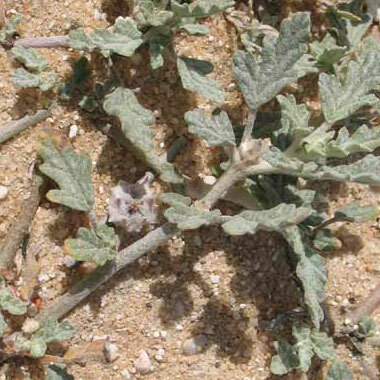 Habitat & distribution: Occasional to frequent in shallow or deep sand; mainly S Qatar. Uses: It is well known that the seed pods embed the in the hooves of livestock and can cause lameness. El Amin states that the fruit is ‘edible by man and loved by many animals’ and Mandaville that the fruit is ‘not unpleasant… plucked well before they begin to harden’.